Roger Federer has defeated Andy Murray in the Wimbledon Men’s Final by 3 sets to 1. It was not the classic many wished or expected , and it not give Britain the Champion her people wanted. Andy Murray started valiantly. Roger Federer started nervously. Andy Murray’s defeat has extended the decades of hurt, briefly numbed by his ascendancy to the Final. He will be remembered as the only Brit to have punctured a hole , albeit slightly in the ever-ballooning decades of pain. Andy Murray had his moments, especially when in the second set he appeared to be taking the set and so probably ‘whitewash’ the Swiss. However, that did not happen in the end. Even the ghosts of Wimbledon past, the wishes and fervour of the whole nation stretching from the Shetlands to the Land’s End. He valiantly attempted to win against Federer; one of the most exciting players of his generation. All his attempts were to no avail. Federer fought gallantly. He came to Wimbledon to win the title that had so alluded him for 2 summers, that most people thought he was on the wane. And maybe there for the taking! Having knocked out his nemesis, Novak Djokovic in the semis, surely Federer must have felt this could be the year in his pursuit of moving further away from Pete Sampras’s haul of Grand Slams. Federer has got 4 more Grand Slams now compared to second-placed Sampras. What an achievement. The elimination of Novak, must surely also have given Andy a glimmer of hope. Perhaps, just maybe…Federer did not play well in the first set, perhaps overwhelmed by the emotions and spirits pervading the Centre Court. He saw hope in the eyes of all the Brits. Perhaps read it in the papers, heard it in the news too. But he came to win. To conquer. The moment he broke serve in the third set, he was just unstoppable. Andy Murray fought hard. Tried his best. Though it was not good enough. The nation’s hopes that had been lifted to statropheric heights were sent crashing down to earth in the fourth set when despite Andy Murray’s determination Federer kept nicking the points. The pain was etched on the fans’ faces , some were evidently crying. Murray’s mother and girlfriend’s tears showed how hurting this defeat was. They were micro representation of the tears streaming down the faces of all those who had so desperately wanted Andy Murray to win. 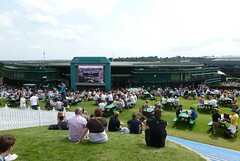 The only happy folk in the land were the Bookies,who avoided a stonking defeat from the punters if Andy Murray had won! Andy Murray, one must add did remarkably well this year. No one really expected him to shine this far. He did and deserves the plaudits he gets. He may not be too far from winning a Grand Slam. But then again, this maybe as good as it gets. Who knows. He is still a great tennis player and that is why he is in the top 5 in the world. He is the best tennis player from the United Kingdom, and has been the only player for some time now that the country realistically expects to at least win one Grand Slam. Tim Henman never went this far, was not as good either.Yet he had a Hill named after him! The nation dearly wanted a British Champion. Roger Federer was the party-pooper. Andy Murray will surely come back stronger for the experience. The day though belongs to the conqueror. He came to win, he saw the hopes, wishes, the pain, and the headlines proclaiming the British Champion was nigh. He defeated all before him. He defeated all the dreams and aspirations of a nation. He conquered. Federer was magnanimous in victory. Andy Murray was gracious in defeat. Federer is no schadenfreude. He is a born winner. A remarkable sportsman. He is again the World Number 1, and it will be interesting to see how Rafa Nadal, Novak Djokovic and Andy Murray respond. What I do not understand though is the grunts that some, if not all of the female tennis players produce. Is it because it’s now tougher to play tennis. I do not recall watching the Steffi Grafs, Martina Navratiolvas, Chris Evert-Lloyds making such noises. I hope my memory serves me right here. Take for instance yesterday’s match between Ms Azarenka and Ms Williams. Ms Azarenka was so noisy that at one point I had to mute the TV sound. I really felt sorry for her. All that pain for the game she loves. Ms Azarenka’s noises were said to have reached 98 decibels at some point. Well that’s rather much coming from such a petite human being. I remember Martina Navratilova once calling those ‘shrieking noises’ a form of cheating. Whether it is ‘cheating’ I don’t profess to know if it or if it isnt. It certainly did not give Ms Azarenka any advantages yesterday. Or maybe we should be asking Ms Williams post-match whether the noises had any effect on her concentration. It certainly puts viewers off. Even those in the confines of the stadium, I am sure seem miffed. According to some papers today, it became a laughing matter after she lost. One paper even ridicules her, describing her as the Screaming Banshee of Belarus. A bit unfair. Apparently according to that venerable fountain of knowledge, Wikipedia, Monica Seles and Jimmy Connors share the honour, the ignominy of being pioneers of grunting in tennis (depends how you see/hear it). Some male players do grunt. It’s not the sole preserve of female players. Djokovic makes noises as well. However, he is no match for the Screaming Banshee of Belarus. I wish they could penalize players for the screeching. It does put people off. It makes you think playing tennis is rather painful. Today’s the men’s semi-finals. I wonder why they do not call it the Gentlemen’s semi-finals, after all the girls’ version is called the Ladies semi-final. Another anomaly is this, the boys do not get addressed as ‘Mr’,yet the girls are addresses as ‘Ms’. Am I missing something here? Well the Great British Hope is playing this afternoon. Mr Federer is playing Mr Djokovic, and as things stand, Mr. Federer seems to be heading for a win. Mr Murray (Hope of the nation) will be playing Mr. Tsonga, the mercurial French Man. Wish the headline writers had come up with some eye-catching politically-charged headline. Remember they did come up with the ‘Debt Derby’ when Germany played Greece at the Euro2012 tournament. It’s the Scotsman (British) versus the Frenchman,surely there must be an eye-catching headline waiting to be uncovered. I have come up with my own- the ‘Battle of the nearly-Men’. This may not be very eye-catching, but I am not a professional journalist! Both have never won a Grand Slam. I am sure by the time you read this Andy Murray will be in the Final. If National fervour could hit aces; serve and volley like Mr. Becker used too, cover green grass like Mr. Djokovic does and scrrech like Ms Azarenka-it would surely be enough for Andy Murray to reach and win the Final. Now that Mr Murray has reached the Final, erasing 74 years of hurt in just under 3 hours of some absorbing tennis, we hope he does win the final.We also hope Federer wins. We are not going to be biased. However, if one is into betting, the smart money would be on Mr Murray winning. We all look forward to a great match. Wishing all the players success. Come on Andy!! Your time is nigh. There is something rotten in the state of…South west London (Wimbledon, to be exact). Millions of pounds are being harvested from Wimbledon every year by the LTA. A good chunk of that is being invested in developing talent. But it doesn’t look like any talent is coming through to challenge in the top rankings. Reading the Boris Becker interview in the Guardian this afternoon made me think. European countries pouring less money in development of junior players seem to be doing a better job than the LTA. This is no criticism of the LTA at all. The problems are deep and embedded in the social fabric. In the north-west part of England I am familiar of, I have never seen a single girl or boy carrying a tennis racket. The primary schools do not seem to encourage this sport. However, other sports like football, rugby league, gymnastics, netball and sprints are well catered for. Is tennis seen as an elitist sport? A southern sport? Or not a sport at all, but just a Wimbledon spectacle? Former Wimbledon Champion Becker’s view is that ‘Tennis is no doubt an elitist sport, it’s expensive; racquets are expensive, courts are expensive, a pair of tennis shoes is expensive. But it is fairly obvious that the LTA is not struggling for money and the question is: what should they be looking for?’ And where are they looking? I hasten to add. A lot of work needs to be done otherwise the whole nation’s hopes will be on one Briton every year, Andy Murray. God Forbid the Scots decide to go independent! Schools must be encouraged to provide for tennis training. The LTA should be helping schools promoting and encouraging this sport at grassroots level. More people need to be encouraged to coach and above all else funding should be provided for setting up of tennis courts. Preferably all-weather surfaces to counter the vagaries of the weather. We need more players in the top 20. We should be looking forward to a Briton winning at Wimbledon. It is a sad indictment of the state of British tennis with one of the most famous tournaments all over the world that Fred Perry is the last Brit to have lifted the trophy.